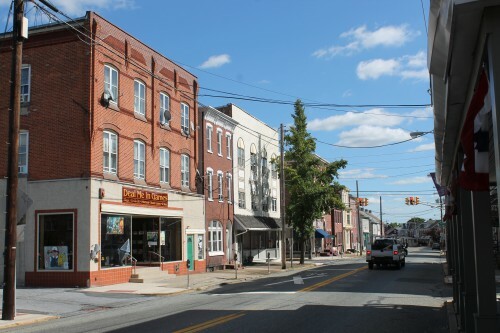 Boyertown has an unmistakable old-time, small-town feel. Traveling northwest from different parts of Montgomery County, you’ll feel the hustle and bustle of a Fort Washington or the subdivided suburban aesthetic of a Lower Moreland fade little by little, until you’re in a spot that’s far removed from the city, but not quite yet in the mountains. It’s calm in the center of town on a weekday afternoon, on a hilly main drag with mom-and-pop shops, and a wooden bear outside the general store. Even the sounds of children walking from school to pre-war rowhomes, three-story houses with picture windows or old-fashioned brick single homes is somehow tranquil. But if it feels like a place where time stands still, that’s not entirely true. There’s history here, and much of it was buried for decades. But since 2013, historians and local volunteers have been working to unearth it. The work’s been centered around the Colebrookdale Railroad, an 8.6-mile stretch from Boyertown to Pottstown. It runs through what’s loosely defined as Secret Valley, and is arguably the birthplace of the American Industrial Revolution. While iron manufacturing existed in different forms around the globe before industry sprung up here, this was the first place, at least in the New World, where so many facets of iron works occurred in one area, and especially on such a large scale. And, the Colebrookdale Railroad was its lifeline. 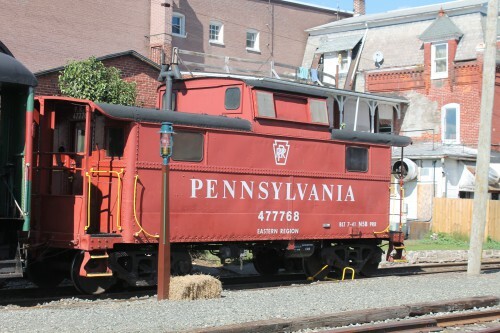 Beginning operations in 1869, it carried freight and passengers past Pottsgrove Manor, the home of John Potts and his “iron empire” in the region. The blast furnaces, refinery forges and iron railroad bridges are some of the oldest in the country, if not the world. Their influence reached well into the 20th century: Materials forged here were used as far as California for the Golden Gate Bridge and in Central America when the United States took over work on the Panama Canal. The line was also a fixture in local society: the engineers were so well-known in the town that the newspapers printed when they went on vacation and where they’d go. On the job, they’d even slow the trains down so children could hop on the back on their way to school. But it’s been a long time since any students hitched a ride on the Colebrookdale line. By the 1970s, it was used less and less, and after bankruptcy consolidations it was bought by the state in 1976 to be preserved. Since then, it was used only lightly by a few commercial companies. But, when given the chance, a handful of those students, along with other local residents, historians and more, rallied around the memory of the railroad to help bring it back to life. “History has been lost. We’re trying to get people connected to it again,” said Michelle Barrett. 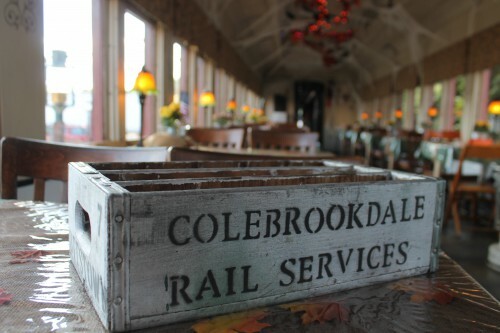 Barrett is the assistant director of the nonprofit Colebrookdale Railroad Preservation Trust. Spearheaded by executive director and preservation law professor Nathaniel Guest, the all-volunteer group has secured grant money and donations to revitalize the railroad line, plan the projects and assemble and coordinate the resources and people necessary to do it all. Thanks to their efforts, the line is now running as a heritage railroad. It offers chartered excursions, historically themed tours and connections to local festivals and community events. As this issue of Montgomery County Living comes out, Colebrookdale will be wrapping up its haunted railroad and bonfire attraction and enjoying a public unveiling. Soon, they’ll be gearing up for rides involving Santa Claus and Christmas carollers. But, the Trust was far from alone in its efforts. Dozen of local residents volunteered their time and effort to restore the line. While there was work to be done on the line itself —- Guest, Barrett and other members of the trust walked the full length of the tracks more than once to identify areas that needed repair — much of that work was centered around the train that would be running on it. With the help of donations and grants, the Trust works with volunteers virtually around the clock to refurbish train cars they purchased that were made around the time the Colebrookdale line was active. Each was gutted and completely redesigned to fit the line’s old aesthetic. In some cases, workers restored pieces or reupholstered old seats. In other cases, they recreated period pieces like valances and ornate moldings. They were fitted with new vents and new paint jobs on the outside to match the old Colebrookdale look. It’s been a labor of love for the small army of workers whose sheer enthusiasm has kept them working for more than a year. One volunteer, noted Barrett, would work “third shift” through the night after his day job to renovate the cars. Right now, the train is has five active pieces, with another coach currently being refurbished. It starts with a leased GP10 diesel engine, followed by the open-air car with hay bales for seats that served as the first passenger opportunity when tours began last year. There’s also a caboose, equipped almost as completely as a studio apartment as they were decades ago when crew members would sleep in them. “Our goal is to do as much as we can to make it as it would have been,” said Barrett. Of course, there are some modern flourishes: This year, they’ve added a coach with those newly upholstered seats, along with fold-up tables and a pellet stove. It’s called the Dawn Treader, following the period tradition of naming train cars after famous ships. Eagle-eyed passengers may spot allusions in the car’s design to the ship of that name from the Chronicles of Narnia book series. Similarly, the dining car, also new this season, contains modern amenities in the staff area like refrigerators and even a high-end wine cooler someone donated. And, there are speakers mounted high on the walls to pipe through announcements and music. But the passenger’s-eye view is decidedly more old-fashioned: simple wooden tables and chairs, and lovingly recreated valances in the windows. Even the station is being retrofitted: already the group has installed period telegraph lines and hopes to be able to send messages to and from the train and stations. And while those transmissions may be a way off, the message of the Colebrookdale Line is spreading much sooner. Part of Barrett’s job now is creating educational supplements for upper elementary and middle school classes. Centered on the railroad’s history and potential, the curriculums will meet state and federal education guidelines so teachers can use them in classes, and in accompaniment to field trips to the rail road. It’s put together in large part from research compiled by Trust volunteers, and also anecdotes and artifacts by people who remember the railroad when it was still thriving — including some of those old students who used to hop on the back. The idea, explained Barrett, is to capture kids’ imagination with “real, living, immersive” history. “As a student, I remember doing well in school, but could never connect with my history classes. I didn’t see how they related to my life,” she recalled. That wasn’t the case for, say, the civics classes and field trips to Harrisburg that inspired her career today. Offering kids a hands-on approach to the railroad, she hopes, will help them appreciate their nation and area’s history, and carry on its legacy. But it’s not just about the past. Schools are focusing more and more on science, technology, engineering and math, STEM for short, these days, and railroads encompass all those elements. And, as the United States falls behind other countries in infrastructure, especially railroads, getting kids interested and enthusiastic about trains means more engineers, workers and leaders of tomorrow working to improve the ones here. Essentially, it brings the legacy Colebrookdale Railroad full circle: rail line that once led the way, literally, to American ingenuity and invention, may do so once again.